The powerful Abaco Site Saw MOD-S1 features a 3HP motor and is guided by dual linear bearing on induction hardened chrome bars. The cast aluminum, machined working table is for accurate cutting of all types of natural and artificial stone. 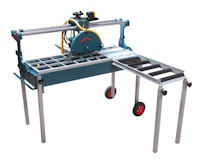 The S1 Saw is suitable for construction sites and workshops. Incorporated in the S1 Saw are wheels and rollers for effortless, single-handed maneuvering. This Saw has an electric, direct drive, submersible water pump.